Cancerology is, by all counts, a non-science, which may be defined as a so-called scientific pursuit in the teeth of obvious proofs to the contrary. Not one facet of current cancerology-etiology, diagnosis, therapy, prevention, and its latest fad, immunology ­enjoys any clear, rational basis. No wonder that the outcome of the whole gargantuan effort is "precisely nil", with possibly more people living on, than dying of, cancer. The pathway to the logical­ly acceptable and comprehensible science is simple-to give cancer its due place in biology, to give the cancer cell its rightful place of but a form of cytodifferentiation, and to give the cancer therapist the supremely relevant role of a palliator. To talk of cancer cure is to deny - the cytosomatic reality that cancer is one's own flesh and blood. Being a part of one's self, cancer need not always be treated. I f a therapist has the right and obligation to diagnose, treat, and prognose upon a cancer patient, he has, hitherto unrecognized, equal right and obligation, not to do one or all of these. Cancer­realism offered in this article can guide a therapist to this often necessary path of inaction. Placebogenesis is an established phenomenon in the therapeutic management of virtually every known illness. This article reviews the various psychological factors which play an important role in the genesis of this important phenomenon. Classification of place­bos along with ethical issues involved in administration of placebos for therapeutic and research purposes are discussed in the article. An increase in plasma cholesterol and fibrinogen and a decrease in blood fibrinolytic activity (BFA) was observed during alimen­tary lipaentia produced by an ingestion of a fatty breakfast by healthy volunteers. Addition of garlic in its both raw and boiled forms to fatty breakfast was found to prevent the rise in cholesterol end fibrinogen in blood and to produce an enhancement of BFA. Fibrinolytic enhancing effect of garlic seems to be mediated through an increase in blood activator of fibrinolysis. A decrease in blood cholesterol may also contribute to this action indirectly as increased concentration of this lipid was found to decrease the BFA. Indirect haemagglutination test has been evaluated in cases of amoebiasis. It gave positive percentages of 90, 91.8 and 68.1 in amoebic liver abscess, chronic amoebic dysentery and amoebic hepatitis respectively. The test was negative in acute amoebic dysentery group. Positivity of 4.3% was obtained in ap­perently healthy subjects. Details regarding above findings, are presented. The present paper is a laparoscopic study of 66 cases of primary amenorrhoea. Biopsy of the ovaries was also carried out in addition to certain laboratory investigations. There were 43 cases of Mullerian agenesis while only 20 cases showed gonadal dysgenesis. There were 3 cases of genital tuberculosis. Though endocrine studies contribute important information, laparoscopy with gonadal biopsy assists in the diagnosis and prognosis of majority of the patients. Clinical evaluation of 50 cases of genito-urinary fistula from January 1969 to March 1917 is presented. In 84% of the cases the aetiological factor was obstetric injury while in 12% it followed hysterectomy. Sixty per cent of the patients had come within one year of the development of symptoms. Eighty per cent of the cases were operated upon by vaginal route while 14% were operated upon by abdominal route and 6% by pereineo-abdominal route. The operative management is discussed. The success rate was 72%. The literature on this subject is reviewed. 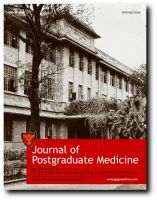 Ten cases of mycetoma of the lower extremity were seen and treated at the Postgraduate Institute of Medical Education & Research, Chandigarh, India, during the years 1973 to 1975. Six were treated by conservative method e.g. antibiotics, sulfonamides and immobilization of the part while remaining four were submitted t o surgery. Four out o f six from the first group had recurrence and has been put on second line of therapy. Recurrence occurred in only one case from the second group and he required an above knee amputation while the remaining three are free of disease and are well rehabilitated. 77 cases of intestinal volvulus seen during the last 6 years have been analysed; majority belong to 20-40 years age group. More than 50% presented after 72 hours of onset of symptoms. Small bowel was the site of volvulus in 65% of cases, transverse colon in 2.6% and sigmoid in 23.4%. 32.5% cases had strangulation obstruc­tion. Volvulus was of primary idiopathic variety in 84.5% of cases. Resection was required in 52%. The overall mortality was 10.5% in the series. 550 cases of acute abdomen have been analysed in detail includ­ing their clinical presentation and operative findings. 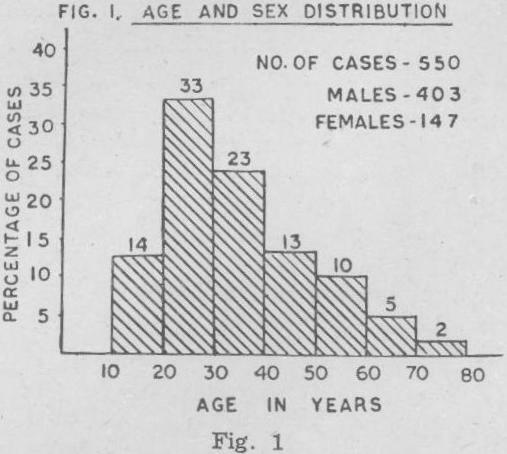 Males are more frequently affected than females in a ratio of 3: 1. More than 45% of patients presented after 48 hours of onset of symptoms. Intestinal obstruction was the commonest cause of acute abdomen (47.6%). External hernia was responsible for 26% of cases of intestinal obstruction. Perforated peptic ulcer was the commonest cause of peritonitis in the present series (31.7%) while incidence of biliary peritonitis was only 2.4%.. The clinical accuracy rate was 87%. The mortality in operated cases was high (10%) while the over­all mortality rate was 7.5%.